It may not look like much but these polymer pebbles (mine) and lichen focal bead (Lindly’s) represent a stretch for both of us and a leap into new territory. Our team experiments may or may not work but we trust each other and egg each other on. 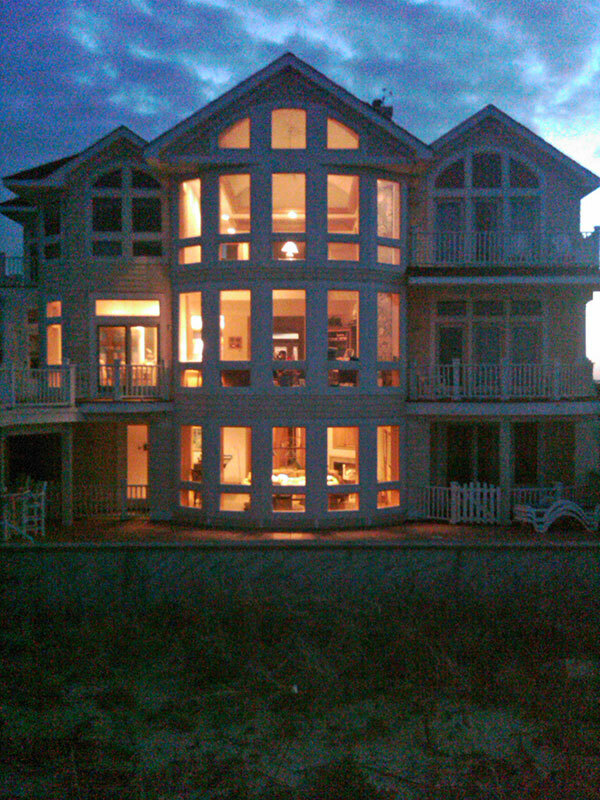 Judy Belcher and Tammy Honaman engineered this week at a sumptuous off-season Outer Banks, North Carolina beach rental as a way to force artists who were comfortable with each other into a situation where they would play and push and tolerate some discomfort. At the end of the project, after the discards and false starts, some new directions will emerge from the collaborations. They’re hoping that you will be interested in reading their upcoming book about what happens during processes like this. It’s cold and gray outside but we’re warm and colorful. Here’s a toast to you readers from the group at dinner tonight. Thanks for following along. We’ll see what happens. oh what a great bunch of creative people – you must have tons of fun out there – I wish I could be part of an adventurous project like this…Maybe sometime. Ah, Cynthia, you make me ” homesick.” The Outer Banks is our family’s favorite vacation “home.” Whenever we go, I always take my art supplies because I find such inspiration there. To be there with a group of artist friends, well, that would just be the icing on the cake! A toast back to all of you! 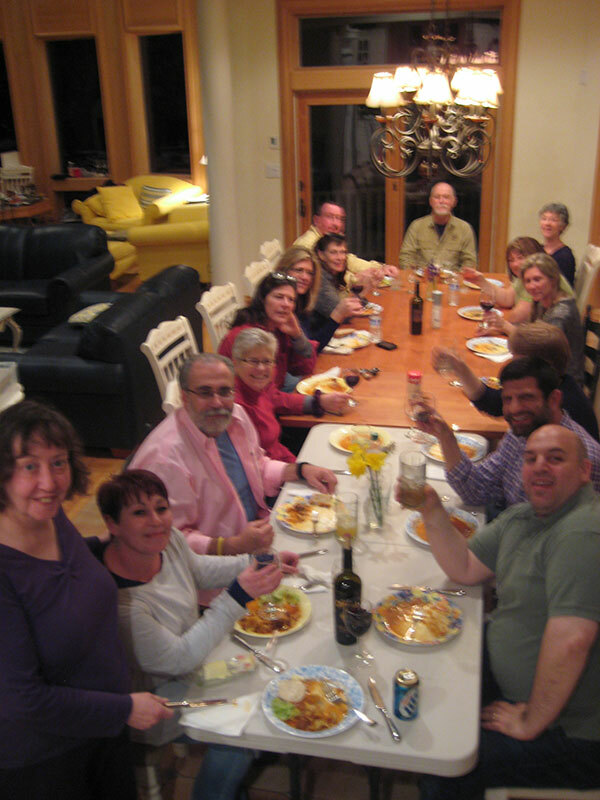 Looks like it was a great dinner with lots of creative souls. Look forward to that book coming out! Oh, covet, covet, covet. Please give Leslie and Judy a hug from me. I hope you all have a marvelous time and discover new, unopened corners in your creative selves. If you can’t do that with this group, it can’t be done. Oh….what a satisfying way to jump start creative thinking. I envy these wonderful souls. I look forward to seeing the book collaboration. With this line up, it can’t help but be special. Best wishes guys!!! I can’t believe I am saying this after the winter Ohio’s had but it is probably a good thing it’s cold and dark so you can concentrate on the CLAY. Your beads look wonderful. I love the colors. Thanks for the toast and I’ll be sure and heft a glass to all the creative power sitting around that table. Can’t wait to see the book. And a toast of tribute back! The creative energy must be awesome. Glad that you are able to be artistic catalysts for each other and I’m guessing the fruits of all the experiments and stretching are going to be awesome. What a group! I know you must have had a great time. Sorry the accommodations where so pitiful. The pebbles look so real, are you sure that you did not go down to the stream and picked some? The Outer Banks is great for the creative spirit. Off season has always been a special time for me to create. I now live full time at the Outer Banks and enjoyed the “off time” this winter creating lots of new things and experimenting. What a beautiful place and group of creative minds to find inspiration! I look forward to purchasing your book!! A return toast to you and all those gathered in the creative spirit at the Outer Banks and everywhere. I look forward to seeing more of what you all have come up with. How wonderful! Great things happen when artists gather and challenge each other. I am fortunate enough to have my own group of ladies that challenge each other in this way. It is a wonderful resource and I am so grateful for it. Lovely beads. 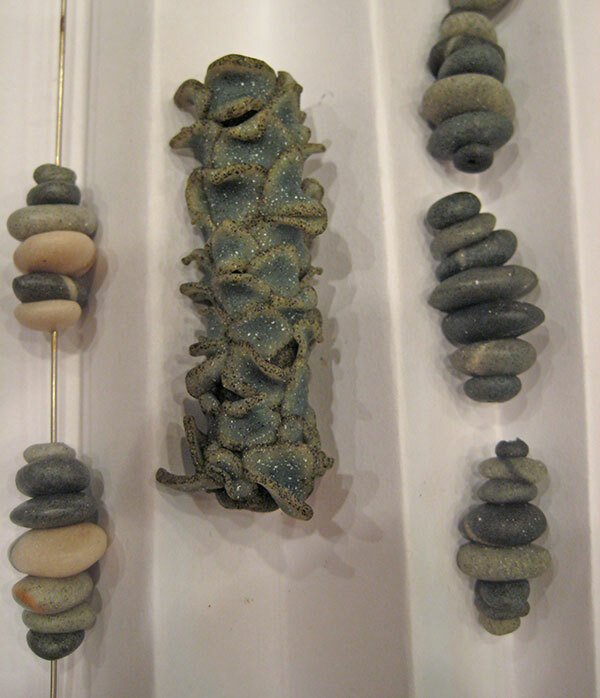 I really find it hard to believe that those are polymer clay pebbles…beautiful. This blog has really opened my eyes up to all the many many ways that polymer clay can be used.